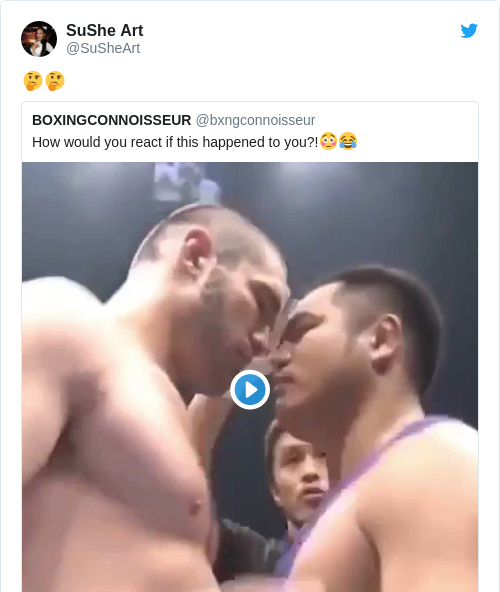 HEAVYWEIGHT BOXER KUBRAT Pulev has been criticised for kissing a female reporter at the end of an interview following his fight in Las Vegas on Saturday night. The Bulgarian boxer knocked out Bogdan Dinu in the Saturday night fight and was interviewed afterwards by Vegas Sports Daily reporter Jennifer Ravalo, known as Jenny Sushe. The reporter asked the boxer a number of questions and at the end of the interview Pulev grabbed her face and kissed on her the lips. She later described the incident as “embarrassing” and “strange”. She also tweeted a video of a boxer kissing another on the lips in the middle of a stand-off before getting punched in the face. Replying to a comment on this post which simply said “Awkward”, she said “Very”. Vegas Sports Daily said its reporter was “the victim of an unwanted, unexpected and unsolicited forceful kiss” as she was attempting to conduct an interview with the boxer. Pulev addressed the incident in a statement on Twitter. He said the reporter “is actually a friend of mine” and that he was “so elated” he gave her a kiss. Later that night she joined me and my other friends at my post-fight celebration. On the video, after our kiss, we both laughed about it and thanked each other. There really is nothing more to this. Vegas Sports Daily said they are working around the clock with Jenny Sushe, and Pulev’s management team to further investigate the matter and determine appropriate actions. “We want to be clear that Vegas Sports Daily values the safety and well-being of our contributors above any ratings, clicks and revenue. The website said what happened to Sushe was “completely blindsiding and unwarranted” and said it shared in her “shock, hurt, embarrassment and general outrage”. Email “'Unwanted, unexpected and unsolicited': Boxer kisses reporter on lips during interview”. Feedback on “'Unwanted, unexpected and unsolicited': Boxer kisses reporter on lips during interview”.